Time for a adventure - multi day trips through the beautiful Czech countryside! Cycling and hiking activities along the Greenways and Moravian bike paths, the Elbe river trails, local places such as Czech Paradise, Karlstejn Castle, Bohemian Switzerland or Cesky Krumlov. Czech Republic has a diverse landscape and good infrastructure creating great opportunities for active, inspiring, authentic and safe travel. To make sure that you get the best possible experience, we provide personal service and assistance, choosing optimal routes according to your physical abilities, interests or special requests. It's easy for us being local to accommodate your needs, to organize people and bike pick up from any point of your trip, quickly help you in case of emergency or to suggest a place to eat or visit. We know how it feels when you travel to new countries, new cultures and only have a limited amount of time. That's why our guides are not only locally experienced but also well-traveled, bringing you a quality service and the helpful information you need. We do not have any overseas offices and expenses, we do not pay middleman or create unnecessary services. All this contributes to fare price, quality service and great travel experience even for people with low budget. We think traveling is like education should affordable for everybody who wants to do it! We are here to share our experience and create for our customers an unforgettable outdoor adventure! The Prague - Dresden ( bike trip is one of our favorite and most popular 3-5 day bike adventure holidays along the Elbe river. It's the perfect adventure for groups, families and solo travellers. You will have an unique cultural and historical adventure while cycling through amazing countryside along the Elbe river, passing peaceful Czech & German towns. We will tip you on the best sightseeing spots and hidden places, help you with bike delivery and accommodation. Find out more details about how to plan this trip including pricing information about the Prague -Dresden Elbe River Tour here on CYLKUS TRAILS our specially dedicated adventure travel website. The Prague - Vienna Greenways bike path network takes you through some of the best towns and sites in the Czech Republic. This trip has everything, it is full of amazing castles, nature and history. Along the way you will experience the local culture including visiting some hidden Czech villages and tasting some of the best wine in the country. Finishing in Vienna, the heart of Art and Music. 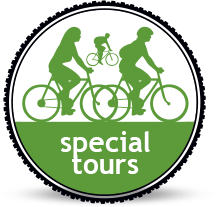 To find out more details to plan the best greenway route for your bike adventure visit CYLKUS TRAILS our specially dedicated adventure travel website. Our Prague - Cesky Krumlov (or vice versa) cycling tour takes from 4 to 6 days. It is full of the best nature, history and sights only to be seen by bike. You will see some spectacular landscapes, visit gorgeous castles & some of the most historical Czech towns and cities as Prague, Tabor, Cesky Krumlov. When you reach Cesky Krumlov you will be fascinated by this beautiful well-preserved unique medieval town. Find out more details about how to plan this trip including pricing information about the Czech Countryside Prague - Cesky Krumlov Tour here on CYLKUS TRAILS our specially dedicated adventure travel website.